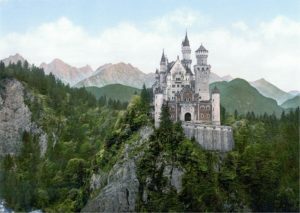 Tour the Neuschwanstein Castle on Germany’s Romantic Road! The Romantic Road in Germany consists of 285 miles of fairy-tale bliss. The journey leads from Füssen to Würzburg and takes its voyagers on a winding path past picturesque villages, Medieval castles, and infinite green valleys. According to the locals, it’s the best (and most amorous) way to experience the quintessential Bavarian landscape. Pack your driving gloves, and maybe your lederhosen, and take the tour down Romantic Road! King Ludwig II’s Neuschwanstein Castle in Schwangau sets the tone for the entire drive. The 19th-century Romanesque Revival palace is set among a backdrop of snow-capped mountains and overlooks the small village of Hohenschwangau. Rumor has it; the castle was the real-life inspiration for Disney’s Sleeping Beauty palace. Stop by for a tour, or stay the night at Hotel Das Rübezahl, a luxurious spa hotel at the base of the Alps. After your castle tour, set your sights for Augsburg, Bavaria’s oldest city. Keep your eyes on the road, but don’t forget to take in the scenery! The peaceful villages and rolling hills are worth the photograph. Once in Augsburg, visit the Fuggerei. The Roman Catholic compound was built in the early 1500s and is known as the oldest social housing complex in the world. A trip to the Fuggerei offers unparalleled insight into Bavaria’s complex history. Lined with pastel patrician homes and encircled by sky-scraping gatehouses, Dinkelsbühl is arguably one of the most romantic stops on the tour. Plan to spend an entire day (or even two) meandering down the many cobblestone streets. On Wednesday and Saturday mornings, the Weinmarkt square comes alive with vendors, flowers, fruits, pastries, and delicious local cheese! The town of Rothenburg might be full of wide-eyed tourists and eager adventurers, but it doesn’t take one ounce of the charm away. The best way to beat the crowds is to plan to stay an extra day downtown! With the gorgeous monastery garden, unbeatable views of the Tauber Valley, and rows of exquisite restaurants, you’ll be glad you chose to stay! Enjoy the sheer splendor of Rothenburg before ending your trip in Würzburg. Travel Germany’s Romantic Road on the Euro Focus, Euro Spree, the Great Escape tour, and more! 2019 tour dates and prices are now available! If you have any questions or want help booking your European adventure, please contact AESU by calling 800-638-7640, or fill out the contact form found on our website! Check out our deals page for available discounts! This entry was posted on Wednesday, February 13th, 2019	at 9:34 am	. You can follow any responses to this entry through the RSS 2.0	feed. You can leave a response, or trackback from your own site.